This double vanity sink is beautiful. Looks very high end, solid piece of furniture. The marble top is also a solid piece and not thin as was previously mentioned. Great care was taken in packaging the vanity as so no damage could be done. I would recommend this to anyone wanting to upgrade a bathroom. This porcelain sink vanity instantly gives your bathroom a modern update. The mission-style design showcases a solid wood frame, carved legs and two gleaming white under mount sinks. Drawers, cabinets and a shelf at the bottom of this white bathroom vanity provides ample space to store all your vanity accessories. Set includes: Vanity Cabinet, Top, and Sinks. Faucets, towels, and baskets shown are not included. Mirror option available with this item. Bought this instead of having the cabinet guy custom build a vanity for our guest bath to save a little $. It came with a marble top, but it was very thin and it actually snapped in 2 while we were moving it to the room, so we had granite installed over top. Looks great! I also added baskets to the bottom shelves. vanity arrived well packaged and in great shape and it looks good. the countertop was in a separate box that provided amazing protection to it. I would think it would be very unlikely that the marble top could get damaged in shipping. the backsplash which is provided as a courtesy (this is so they aren't obligated to replace it if its breaks in transit) actually comes in two equal sized pieces. That makes it much less likely to get broken in transit, but I wasn't crazy about the look when I realized that was the case. however once you put it in place you don't really take notice of it. we are definitely happy with our purchase. definitely seal the countertop immediately after installing. for real, seal it! 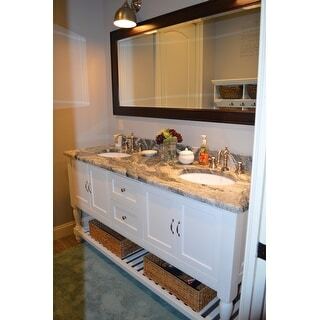 This vanity looks very quaint and gives our Master Bathroom the spa look that we had hoped for!! We are renovating our waterfront home and wanted to go with a quaint cottage feel but not break the bank. Whlle we are at the end of our renovation budget, we were able to find and purchase this beautiful double vanity. It ties right in with the look and the feel of the Master Bathroom that we had envisioned!!! The marble top is absolutely stunning and has a very rich appearance. There is a lot of storage in the cabinets and the drawers and we have placed nice decorative towels and baskets underneath on the shelf. We have received so many compliments on this vanity and have given the link for this product to my friends. Thank you so much for creating such a beautiful piece!! Just got this beautiful vanity. The quality is great, the colors true, and the delivery went well. Kudos to the manufacturer for packing the entire vanity (including the white carrera marble top) extremely well for shipping and arrival. We bought this vanity for our new bathroom (coastal house) and it looks fantastic. Only one slightly inferior aspect: the backsplash is delivered in two pieces and stretches just 4” high. In my opinion, a single piece vanity that’s 8” high is best for effectively serving as a bathroom backsplash. We plan to pick up a matching piece from a local stone shop. Anyway, this is a great vanity, a terrific value and high quality. I wouldn’t hesitate to again order from this manufacturer. The soft close doors and drawers are a MUST have. My wife is no longer waking me up slamming the cabinet doors in the morning. The marble is beautiful. My husband and I are both quite pleased with this vanity. It is sturdy and well made and the marble top is thicker than I was expecting. We were delighted that a backsplash was included. Everything was packaged well. There were no instructions for attaching the countertop and sink... thank goodness for you tube. One thing to keep in mind. The legs are flush with the back of the vanity. This poses a problem with floor trim as the vanity back will be against the wall, and so too, the legs, leaving no room for trim. All in all, a lovely "Pottery Barn" style for about 1K less. That's a win! Great and beautiful piece. It was the best looking model we came across. It comes fully assembled and with a marble top. The marble top is really nice. Shipping was great and the shipper had great customer service. It is a large piece so it comes on pallets and you need to be prepared for that. It was very heavy, but once we had it in place It was very easy to install. We didn't even need a contractor. The drawers and cabinets have soft close hinges which is great, but they are a little stiff to open, stiffer than we expected. At the production facility they cut the backsplash in half "to prevent breakage" but I would suggest you request they don't cut it and just try to be careful, it doesn't look quite is good when it is cut. The size is 70" which is important to note, not 72" like many of the double vanities. Overall, its definitely a recommended purchase, it looks very expensive and high quality. Love the Carrara top, exquisite. The wood work is well made with details such as dovetail drawer boxes and finger joined panel. Soft closer works very smooth. All friends at the house warming love the product. This vanity is beautiful but I wasn't as pleased with the marble top. There is a large white portion with no grey running thru it and it's a contrast to the rest of the marble top, which is beautiful. Love the vanity though. When looking into bathroom vanity options for our new construction, our designer was offering my husband and I so many vanities that were way above our budget. 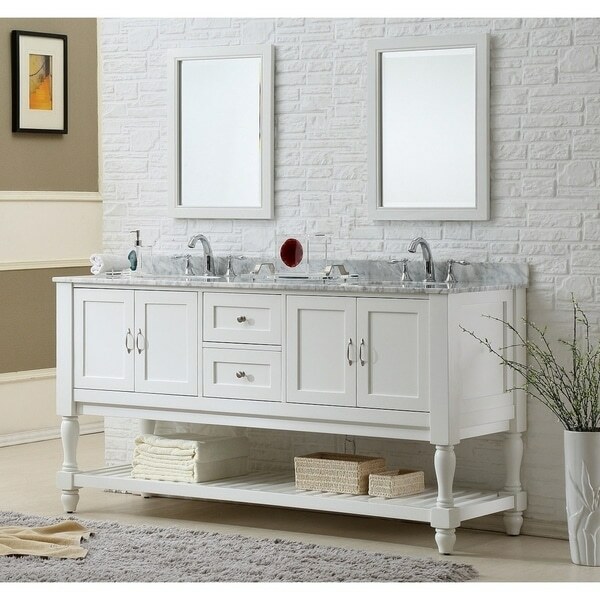 When we started to look online, we found this model that was the exact same as vanities for twice as much through our bathroom vendor. Great quality and beautiful finish details. Great looking vanity was very pleased with the look. I read the reviews about the thing counter which it is thin and was super careful on the installation. All went well and I am very please with how pretty and polished it looks! Vanity has a solid well made feel to it. The taller stance makes for more comfortable use - no more hunching to get to sink level! Great classic look for our remodeled bathroom. We love it! Really nice looking and well made. The soft close drawers are a nice touch. There were no instructions included, but they are not really The back of the cabinet is completely open so it works no matter where your plumbing comes in. The vanity is beautiful however when I received it the marble vanity top was damaged. 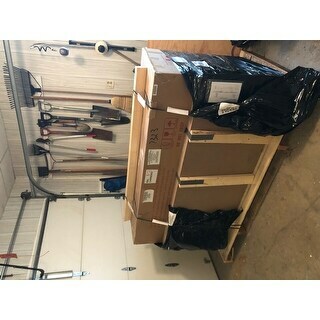 I called Overstock and I received assistance it did take a couple of days to finally get a response however once I did submit pictures they did contact me and I got my vanity marble today in perfect condition so excited. I appreciate Overstock customer service and follow through. Beautiful, functional, solidly put together. Love it! "Can you post a photo of back of cabinet? How far do the draws sit from the back of cabinet. In other words, we need at least 2-3 inches space between the drawers and the back of the cabinet/ Susan j. Nov 3, 2018 We need the drawers to sit at least 2-3 inches from the back of the cabinet. Can you give us measurements from back of where drawer sits to back of cabinet? Thanks Susan j. Nov 3, 2018"
There is about 4” of space form the back of the drawer box to the back of the cabinet. "Is the plumbing access to the two sinks directly under each sink? Is there open access in the back enough for the drain to come from the left side, or the right side? Or does the back of the unit have to be notched out?" The plumbing access is in the back of the cabinet. The back of the cabinet is totally open for plumbing access. The rough in is recommended to be 24-26 inches above the floor. "Is this piece (70") available in a single sink version or without the counter top, or sinks?" At this time, those specifications are not available. "I'm very interested in purchasing this product, but the only thing holding me back is that it does not come with backsplash. I've never seen a vanity without a backsplash. Can you please offer a solution to this issue? Surely this backsplash piece is out there somewhere since it is included in the picture. Can it at least be purchased separately?" Hello aquavista, we do apologize ,we do not currently offer the backsplash separately at this time. Please feel free to contact us again with any further questions. Thank you for shopping with us! Ours came with two additional pieces of marble that span the width of the vanity. We used them as a backsplash, a little weird to have a seam in the but otherwise it looks good. "I do not understand the two options: $*** with Carrara top and 2 mirrors. Or $*** with Carrera top. Seems confusing. Can you please clarify?" Hello Bathroom, one option includes the mirrors as well. Please feel free to contact us again with any further questions. Thank you for shopping with us! "Does the granite top come attached to the cabinet? if so, is it easy to remove if we choose to replace the granite? thank you"
Hello Lucie D., the top does not arrive attached to the cabinet. It will need to be attached once the vanity arrives. You are welcome to replace the top, as needed, using the instruction manual that is included with the vanity. Thanks for shopping with us! "Does the top arrived a fixed to the cabinet?" Hello Lucie D., the top is not attached to the cabinet. The top will need to be attached. Thanks for shopping with us!